I'm 30,000 feet above the ground, crossing the snowy and icy lands of China, East Russia, and Greenland. I'm coming back to Chicago from Beijing after The Beijing International Art Biennale. The navigation line on the screen on the front of me is slowly crossing Russia straight North and a bit East of Baikal. It's near an area where I was hiking and kayaking about 30 years ago. Maybe some people are there right now challenging themselves as I did. The line on the screen slowly moves. I can’t take my eyes from patterns of clouds, endless plains, curves of sea shore, and the far off white Greenland mountains. Henry Moore remembers traveling frequently on a train from his parents’ home to London while he was a college student. He was always completely absorbed by the landscape outside the window, leaving him unable to read. I felt that I was under the same magical spell. In Beijing I met hundreds of people from all over the world. There are so many differences yet so many commonalities. Surprisingly I feel that to see people is even more important than to see their art. There have been people and there has been art, and to meet artists has been as important as to see their art. I would not say that I love all I have seen. Some pieces have been interesting, some looked average, a few were really terrific, and some... I couldn't accept as artwork. How does something become a piece of visual art? Without looking at the dictionary I would say art is "a visual statement". If an artist has to say something important, I respect it, and even love it if it clicks with my emotions. If I do not see the point something inside me rejects the piece. I can't respect art created for marketing purposes if it is only wrapping itself on the most trending ideas. In what I just said there is a lot of controversy. However, those thoughts pushed me to start Absurd Diary. I had the idea to parody some kind of art that I couldn't take seriously, which looks for me like the absurd. Very soon I slid down to the different ground. I realized that sometimes art is only part of the picture and why should I limit myself? So, I took my iPad and I was happily making sketches for the next couple of hours. I sketched "What is our Way?" depicting a suicidal tendency of our humankind. The second one was "A Fish in Oil" a reminder of our responsibility in this world, then more and more... It was too easy. It was fun, but it was way too easy. Could something this easy be art?t. I feltthat I began to create the art that I was trying to separate myself from. However, I turned some of my sketches into clay. 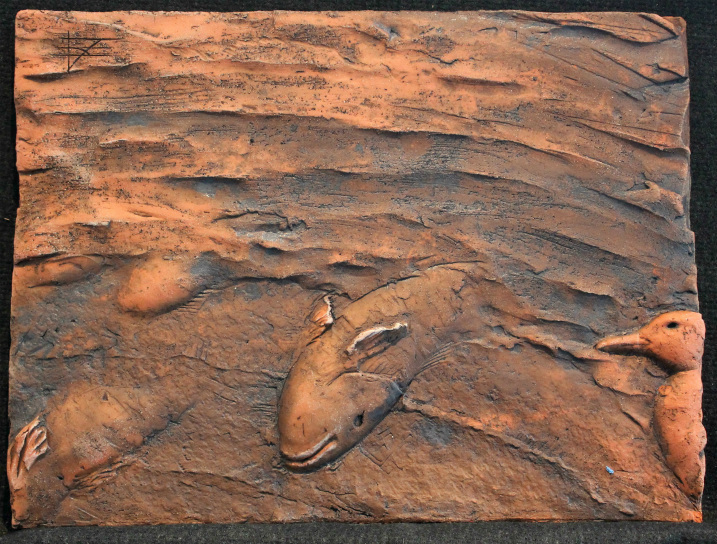 I sculpted reliefs in terracotta. I worked in the same size, I wrote a diary! Sometimes I changed the scale and my style: I created “Memorial Pond,” a dedication to American culture and a reflection of the sad thought that old American values are getting washed away by a new reality. Of course, there is also“Mr. Fraud” and “Mrs. Lie,” my contribution to the last presidential elections. Sometimes I feel that I should slow down with my “Diary.” It takes me away from the path that I consider more important for my art and for myself. On the other hand, there is no “wrong way” in art. I guess instinctively we go from the darkness to the light no matter how we understand those terms.